Books offer a great way of learning and at a much lower price than taking, for example, a specialist course. By reading a book, you consume a huge amount of research in a relatively short amount of time, and it is one of the best ways to improve your skills. The only problem is that there are a lot of accounting books in the market and there are much more to come. For instance, just doing a search for “Accounting” books in Amazon results in more than 235,512 books about Accounting, so how do you make up your mind about what to read? You can do a google search and search for the best Accounting books on a certain subject, but then you get hundreds of “Best of Lists” in front of you, so that doesn’t help a lot either unless you want to spend a full day going through all those lists. Well, that is exactly what we did! 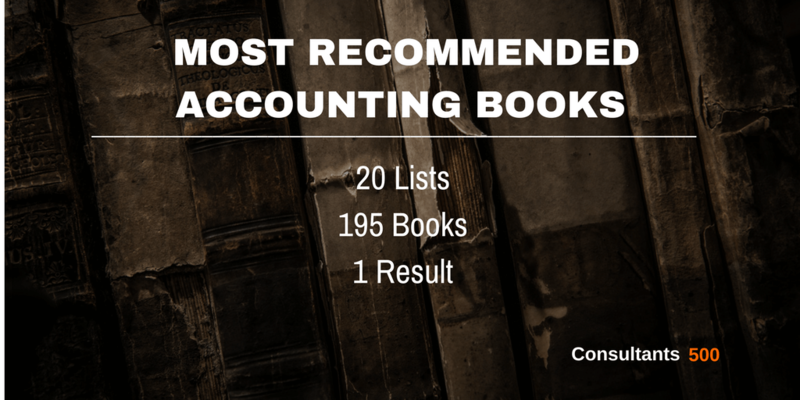 We searched for 50 “Best of Lists” highlighting the most recommendable Accounting books, selected and combined the 20 most valuable “Best of Lists” and earmarked and ranked what Accounting books keep up appearing on most of those recently published lists. From a total of 195 books reviewed and ranked, here are the 15 most recommended Accounting books! As we are a small business ourselves, we use this list as well for educating and inspiring our minds and for optimizing our Consultants 500 platform, where you can search for and find a wide range of independent Business Advisors, including many Accounting Professionals all over the world. 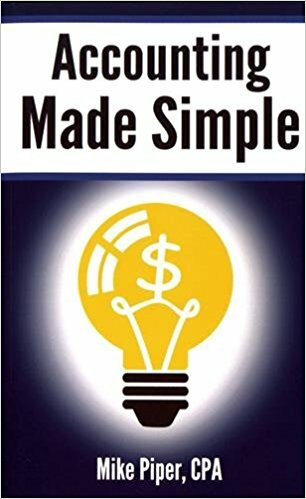 Listed 8 out of 17 times, this book makes things straight and simple with practical and straightforward examples that help sheds light on the concepts without the unnecessary jargon of the technicalities. The basic concepts of various topics are covered, like Accounting Equation and its significance, reading and preparing financial statements, calculation, and interpretation of several different financial ratios, the concepts, and assumptions behind GAAP. The accounting textbook is a quick read for the early beginners gripping them till the end as well as helping the novice to refresh their concepts. It basically gives a fast and systematic introduction to accounting concepts and is used for instance by business owners and students helping them to prepare for their accounting classes. Listed 5 out of 17 times, the well known For Dummies Series is a powerful one-stop accounting reference. It offers a basic understanding of accounting practices and is relevant for anyone who handles money. Knowing how to balance the books and stay in the black is vital for keeping a business afloat or keeping your checkbook balanced. 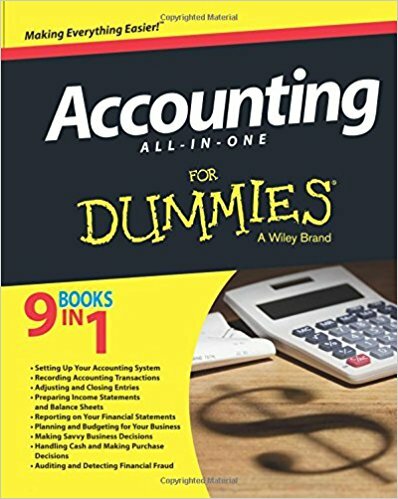 If you need to keep your books in order, this new edition of Accounting For Dummies helps you get a handle on all those columns of numbers. by Stig Brodersen and Preston Pysh. Listed 5 out of 17 times, this is one of Warren Buffet’s three favorite books. Buffett’s style of investing starts with fundamental analysis before it moves onto pure accounting research. This is the book aimed at enlightening investing professionals who have just set their foot into this industry. It is a treasure trove, as the book is to the point in explaining the requirements to analyze financial statements. There is no beating around the bush or unnecessary examples which will bog you down. It’s a textbook on investing that every fresher should invest in for his successful career in this profession. 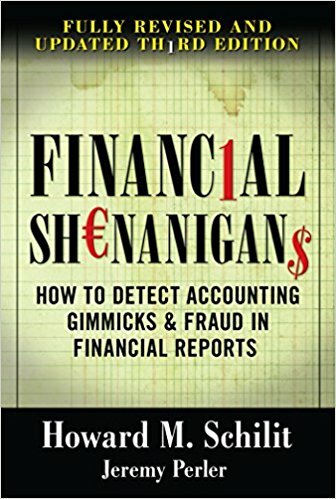 Listed 6 out of 17 times, this book contains various types of accounting frauds and gives real-world examples as well as suggestions on how to detect fraud. The book is an investment for not only financial professionals but for the layman to understand the gimmicks played upon by master head company makers to trick the investors. The author is a well-known authority on forensic accounting. 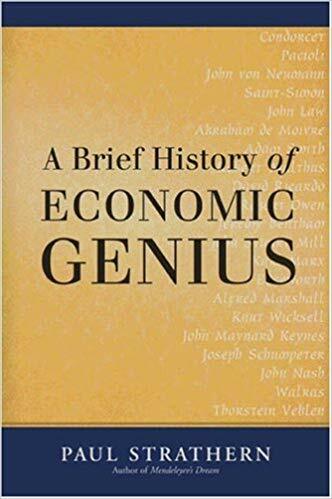 Listed 3 out of 17 times, is one of the most accessible and interesting books in terms of describing how the intersection of math, business principles and philosophy have shaped the field of economics over the last few centuries. The author uncovers the definite progression of mathematics and economic theory, from double-entry booking keeping to the discovery of standard deviation and the various applications of probability theory. Listed 3 out of 17 times. This is an excellent introductory book on the subject, providing all information quick and easy. From the Balance sheet to the profit and loss statement (income statement) and onto the cash flow statement. The ideas are presented in an easy to understand way with good examples. It is a book that is meant for every start-up business, given the chance to finally understand the numbers and to present the numbers accurately and correctly. Listed 3 out of 17 times, handles both accounting and tax issues in a funny manner throwing the seriousness completely out of the window. Small business owners often get so dogged by complexities of the legal entities that they often miss out on their product spelling doom for them in the long run. In this book, the author explains things like tax write-offs and also outlines several things needed to watch out for, to avoid being pulled up for tax fraud and/or evasion. Listed 3 out of 17 times. Aswath Damodaran, a well-known finance professor at Columbia Business School and an experienced investor, argues that the power of story drives corporate value, adding substance to numbers and persuading even cautious investors to take risks. In business, there are the storytellers who spin compelling narratives and the number-crunchers who construct meaningful models and accounts. Through a range of case studies, Narrative and Numbers describes how storytellers can better incorporate and narrate numbers and how number-crunchers can calculate more imaginative models that withstand scrutiny. Listed 4 out of 17 times, it presents financial information in a format so simple and so unlike a common accounting textbook. This book uses the world of a kid’s lemonade stand to teach the basics of financial language and records. You’ll run your own lemonade stand and make it grow by creating signs to advertise it, borrowing money from Mom, buying lemons and sugar and selling to the whole neighborhood. Even if you know how to read a balance sheet, this book is sure to help you view the same in a new light. Listed 4 out of 17 times. This 123 pages long book is filled with tables that clearly demonstrate how Business Accounting is to be done. Accounting for Small Business Owners covers the entire process of establishing reliable accounting for your business and everyday financial scenarios, and will show you how to set up and run your business; manage and sell your product or service, and perform a month-end balancing of accounts. It covers all the financial accounting a small business will ever need. Listed 4 out of 17 times, this textbook is used in many academic courses because it provides such comprehensive information about financial accounting. This edition retains each of the key features (e.g., TOC, writing style, pedagogy, robust EOC) on which users of Weygandt Financial have come to rely, while putting the focus on international companies/examples, discussing financial accounting principles and procedures within the context of IFRS, and providing EOC exercises and problems. Listed 3 out of 17 times, it is a must-have book to understand finance. Visual Finance is a powerful, simple tool that you can learn in just a couple of hours and easily apply to real-life. Over the past five years, this model has been used in thousands of “finance for non-financial managers” training sessions in more than 30 countries. Listed 3 out of 17 times, this book embraces the basic theme of “different costs for different purposes.” It reaches beyond cost accounting procedures to consider concepts, analyses, and management. Professional issues related to Management Accounting and Management Accountants are emphasized, and chapter topics cover the accountant’s role in the organization to performance measurement, compensation, and multinational considerations. Listed 5 out of 17 times. This bestselling book is designed to help anyone who works with financial reports–but has neither the time nor the need for an in-depth knowledge of accounting–cut through the maze of accounting information to find out what those numbers really mean. What distinguishes Tracy’s efforts from other manuals is an innovative structure that visually ties together elements of the balance sheet and income statement by tracing where and how a line item in one affects an entry in another. Listed 3 out of 17 times. This book lays the foundation for readers to succeed on the CPA exam and ultimately in their professional practice. The new edition continues to reflect the conversational style and clarity that has made this a leader in the market. It explores the key concepts and principles while using the PepsiCo financial statement to clearly show how the information is applied in the real world. 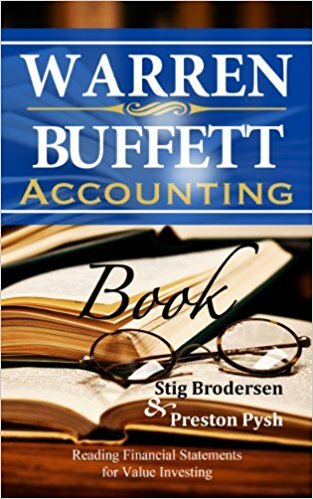 This book literally takes its readers from the very basics of accounting to the corporate level of accounting. Each chapter is full of colorful pictures, diagrams, examples, and summaries. We made a list of 50 posts that we recently published about “Best Accounting Books” to read. We combined the 17 lists about “Best Accounting Books” and earmarked all individual books that were on those lists. All lists were summed up, and the Accounting Book with the lowest number was ranked 1, 2, 3, etc. This resulted in the final “Top 15 Accounting Books Recommended Most Times” that have been read by many small business owners and/or accounting experts. What is a Good Book to Learn Business Accounting?